In April 1915 the allied lines at the beginning of the Second Battle of Ypres ran from the cross-roads at Broodseinde, east of Zonnebeke on the Ypres-Moorslede Road to the cross-roads half a mile north of St. Julien, on the Ypres-Poelkapelle Road, roughly following the crest of what is known as the Grafenstafel Ridge. On 22 April the Germans attacked between the canal and the Ypres-Poelkapelle Road. At first there seemed nothing unusual about the attack since movements of troops and transport behind their front line had been monitored for some days. However there was a nasty sting in the tail to this action for the Germans had secretly brought up apparatus which emitted an asphyxiating vapor or gas, and this had been distributed along their front to the west of Langemarck. That Thursday the wind blew steadily from the north, and by afternoon, all being ready, the Germans put their plan into execution. 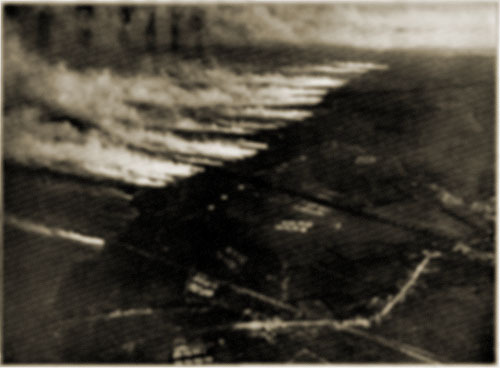 At some time between 4 and 5 p.m. the Germans started operations by releasing around 150 tons of poisonous vapor which rolled swiftly before the wind from their trenches toward those of the French west of Langemarck and held by a portion of the French Colonial Division. After allowing sufficient time for the fumes to take their full effect the Germans charged forward over the practically unresisting enemy and penetrating through the gap pressed on silently and swiftly to the south and west. The first intimation that all was not well was conveyed to the British troops between 5 and 6 p.m. as they saw the French Martinique troops retreating in front of a wall of vapor. Behind the wall of vapor, which had swept across fields, through woods, and over hedgerows, came the German firing line, the men’s mouths and noses, it is stated, protected by pads soaked in a solution of bicarbonate of soda. The Germans used gas on a number of occasions after this including: Ypres on 26 April, on 2 May near Mouse Trap Farm and on 5 May against the British at Hill 60. The gas used in this engagement was the result of earlier experiments done with Bromine, a halogen that has seven electrons in its outer energy level and shreds weaker elements such as carbon to get its eighth. As early as August 1914 the French had fired shells loaded with Bromine at the Germans but the wind had blown it away before the Germans were even aware of any attack. But it was the German’s chemical weapons program under Friz Haber, the creator of chemical fertilizer, that really propelled gas warfare into the limelight. By late 1915 Haber and the German industrial and scientific war machine had developed a shell which would maintain its trajectory even when filled with xyxlyl bromine – they called it ‘weisskreuz’ or ‘white cross’. On 31 January 1915, at the Battle of Bollimov, 18,000 of these shells were launched at the Russians, but the temperature was so low the gas froze and the attack was a failure. Haber then decided to switch to bromine’s chemical cousin, Chlorine, which is even more aggressive when it comes to acquiring that extra electron. Chlorine turns victims’ skin yellow, green and black and glasses over their eyes with cataracts. Death is usually the result of drowning from the fluid buildup inside the lungs. These blue, green and yellow, chlorine based gasses which floated across the war zone were the ones which finally caused the mayhem and destruction like that in the French trenches at Ypres. Ironically Haber in 1919 received the vacant 1918 Nobel Peace Prize for his process which converts nitrogen into fertiliser, and in the 1930s his Jewish roots saw him exiled from Germany by the Nazi’s.